As I study for my end of semester tests, I can draw many parallels between college finals and milking cows. Finals week is around the corner and many college students, like myself, are trying to stay motivated to finish this semester strong. I thought comparing college finals to milking cows would be a fun way to lighten the mood. But, as I started to think about it, I found that preparation and final exams are very similar to the routine of milking cows . . . which is too bad for me, because I was usually in charge of feeding cows on the farm! First things first, you must study for finals. I usually assemble a study team for each specific class and choose friends and classmates who I know understand the subject, have a positive attitude, and work hard. This is very similar to milking cows with my family. My ideal cow milking team would include my mom (the brains) and two of my older sisters, Emily (she keeps things positive) and Annie (the heavy lifter who gets the job done). Next, to “prep” yourself for the test, you should get a good night’s sleep, eat a healthy breakfast, and make sure you have pencils, paper, calculator, and whatever else ready the night before. Cows need the same care to produce high volumes of milk. Comfy, clean stalls plus good ventilation minus inconstancies in rations equals a happy cow. Now, once you make it to test day, you may think that there is nothing left you can do to be ready for this final. However, going through the motions should be the last thing you do. Get your head in the game by waking up early, showering, and getting yourself a cup of coffee. 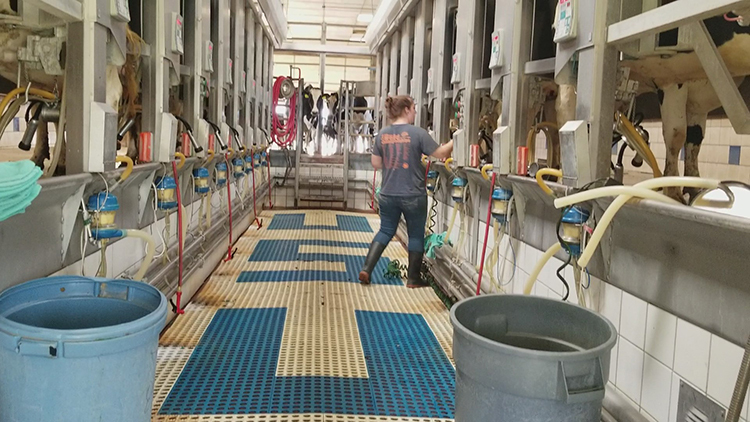 Just like when it is crunch time in the milking parlor, you need to be focused and following protocols each time you prep a cow. Remember to cover the whole teat in dip, give it 30 seconds to disinfect, strip the teats, be vigilant about looking for abnormal milk, and make sure the udder is clean before attaching the unit. By the time you get to your last final, it is pretty easy to start slacking. Preparing yourself as well as you did for the first will show on your final score. Same goes for when you’re milking cows. Give the last cows in the barn or pen the same attention and care in the parlor as the first group. If you don’t, you might see it affect your somatic cell count, and that is one test you don’t want to score high on! If you still need some more motivation, just think about how your final grades will affect your upcoming scholarship applications. The cost of doing well on finals is high when you factor in the future. Keep this in mind, too, when taking care of those milk cows. It is difficult to give 100 percent every day, but those little inconsistencies add up. Lost milk production and mastitis is just the beginning when it comes to your herd.